I especially love "EXTRA" in the middle! That looks like something my kiddos would have done! We've made those applesauce ornaments MANY years ago. Good memories. This is the exact same recipe I use and I love it!! It makes the house smell so good too! We made those last year and they smelled so good. 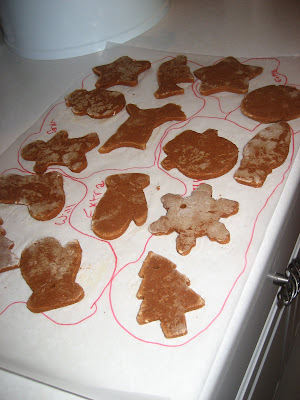 I think I'm going to try salt dough ornaments this year with Noelle so that she can paint them when we are done. Darling! My kids both made these in 2nd grade as their "holiday" gifts to mom and dad. The whole school smelled great! We should make these. I love Lisa's book! It is one of my favorites. It really helps me make the most of the busy holiday season. What a great idea! I think your family does the sweetest things together :)! The boundary lines make me chuckle! I want to try that, I was just thinking about cinnamon ornaments earlier today. Been praying for you during this holiday season. Thanks for commenting on my post...this pie you actually just bake into one of those grahmn cracker crust...very easy. I don't even own a springform pan, I always thought you couldn't make cheesecake without one, but this one is tasty and easy. Have a great holiday season. How cute! Making ornaments is on our list for this month and I am going to add this as a possibility. I haven't figured out exactly what to do with the kids yet. The kids told me they totally want to do this tonight! And I have that book waiting for me at the library now so we can do some other fun things. this is great! I think I will make these for our staff!!! btw, I don't think ever responded to your comment on my blog....sorry. I did know you were from Arkansas!!! Maybe you will come back for a visit and we can meet!! !